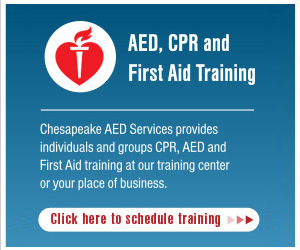 Chesapeake AED Services is an authorized training center for the American Heart Association (AHA) in Baltimore, MD. Any of our CPR classes, CPR certification, First Aid courses provided are part the AHA course curriculum. We are proud to provide in-classroom and online AHA CPR and First Aid programs, as well as training off-site at your facility. Our AHA CPR, AED and First Aid course is a classroom setting, hands-on, instructor-led course that teaches adult CPR and AED use, as well as how to relieve choking on an adult and child. Students will have a hands-on, interactive experience, asking questions and providing feedback during the CPR classes. The classroom CPR AED First Aid session lasts about 3 and 1/2 hours. Online training typically takes about 3 hours including the in-classroom skills check test. These courses are for anyone with limited or no medical training interested in basic lifesaving skills as well as those who need a course completion card in CPR and AED use to meet job, regulatory or other requirements. Heartsaver AED is basic CPR and AED for the lay responder. It is a classroom, video-based, instructor-led course that teaches adult CPR and AED use, as well as how to relieve choking on an adult. This course teaches skills with AHA’s research-proven Practice-While-Watching (PWW) technique, which allows instructors to observe the students, provide feedback and guide the students’ learning of skills. Classroom sessions last about 3 and 1/2 hours and online typically takes about 3 hours, including the skills check. Heartsaver AED & First Aid is a classroom, video-based, instructor-led course that teaches students critical skills needed to respond to and manage a First Aid, choking or Sudden Cardiac Arrest emergency in the first few minutes until emergency medical services (EMS) arrives. Students learn skills, such as how to treat bleeding, sprains, broken bones, shock, and other First Aid emergencies. This course also teaches adult CPR and AED use. Heartsaver First Aid is a classroom, video-based, instructor-led course that teaches students critical skills needed to respond to and manage a First Aid, choking or Sudden Cardiac Arrest emergency in the first few minutes until emergency medical services (EMS) arrives. Students learn skills such as how to treat bleeding, sprains, broken bones, shock and other First Aid emergencies.